STARTING TODAY: Turn Tennis Elbow & The Pain It Causes You Into A Past, Forgotten Memory! Are you suffering from swollen tendons that make your arm sore and sensitive? Would you like to deal with the unwanted symptoms of tendonitis that keep you away from your favorite sports and activities? Meet The Best Tennis Elbow Bracelet That Melts Your Pain Away & Shields Your Arms Against Further Injuries! In order to treat effectively the painful tendinitis symptoms, what you most need is targeted compressions. 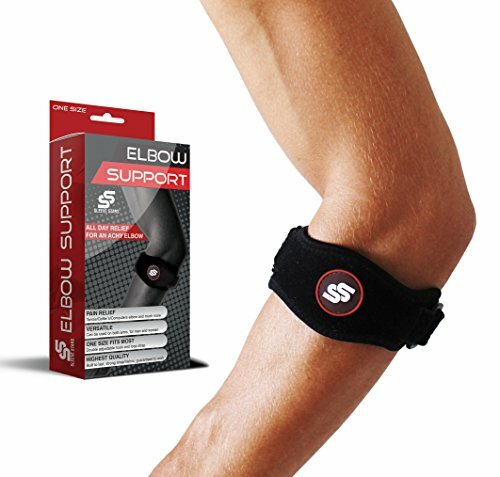 This fully adjustable elbow band, with the especially designed gel compression pad it features, will effectively eliminate pain with acute or chronic tennis elbow. Note also that this miraculous elbow brace, thanks to its adjustable hook and loop straps it fits great any forearm between 9-23 inches and can be used on both left and right arm, while it can work wonders on anyone, men or women. A Versatile Tennis Elbow Bracelet With Dozens Of Applications, For Anyone In Need! Sportspeople: Unique support for anyone interesting in Tennis, Golf, Basketball, Baseball, Racquetball, Badminton, Squash, Football, Volleyball, Martial Arts, Triathlons, Obstacle Races, Rowing and more. Gym Enthusiasts: Great help for people who are into Weightlifting, Bodybuilding, CrossFit, WOD or any other training. Those in risk of Repetitive Stress Motion Injuries: Unmatched relief for anyone who likes Hiking, Fishing, Pool, Billiard or for those that make extensive computer mouse usage, resulting in swollen, fatigue arms. Try It Today & Get Back In Your Regular Activities With Great Protection & Comfort. Remember: Buy 2 and get 10% off on both braces! - Order Today! ✅ ELIMINATE PAIN & DISCOMFORT: This brace is especially designed to relieve you from elbow pain that troubles you and your body. The compression pad is designed to give pressure to help your forearm recover from injuries and fatigue, while at the same time it protects your vulnerable tendons from further strain. This is definitely a great choice for anyone suffering from tennis or golfers elbow tendonitis, carpal tunnel syndrome or arthritis. ✅ THOUGHTFUL DESIGN: This handy bracelet features two fully adjustable hook and loop straps that stick anywhere on the brace, so that it can stay securely in your hand all day long. Note also that for your convenience you can also wear this amazing brace on both your right and left forearm! And as this tennis elbow bracelet can fit any forearm from 9-23 inches (22-59cm), it can be definitely used by both men & women. ✅ UNPARALLELED QUALITY & DURABILITY: Made of the highest quality materials (25% nylon and 75% neoprene) this pain-relieving brace is a product made to last. Rest assured that this bracelet will not wear out, no matter how long you use it! Its unmatched quality and great performance will never let you down! ✅ A VERSATILE BRACE FOR ANYONE IN NEED: This bracelet can be definitely used by any sportsperson who suffers from tendonitis or who wants to keep their arms shielded against injuries. Great for Tennis, Golf, Volleyball and more. Note also that this brace can offer great relief to people with elbow pain caused by extensive computer mouse usage, work or any other cause! ✅ SUPREME COMFORT: This handy bracelet is made of flexible and breathable materials to ensure that you can still enjoy your favorite sports while wearing it. Its great fit and texture doesn't restrict hand movement; in contrary it supports your swelled tendons, helping you go a step further! If you have any questions about this product by Sleeve Stars, contact us by completing and submitting the form below. If you are looking for a specif part number, please include it with your message.